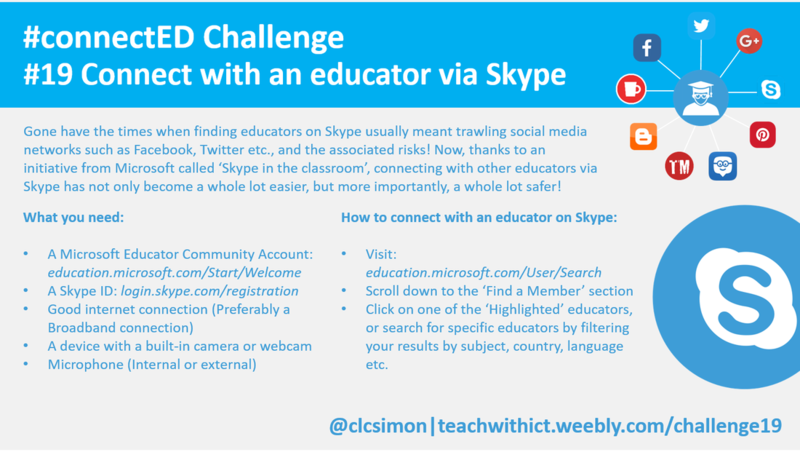 Challenge 19: ​Connect with an educator via Skype in the classroom. In the past, finding educators on Skype usually meant trawling social media networks such as Facebook, Twitter or LinkedIn etc., and, as you can imagine, was not without its risks! However, thanks to an initiative from Microsoft called ‘Skype in the classroom’ (https://education.microsoft.com/skypeintheclassroom), connecting with other educators via Skype has become so much easier, and more importantly, a whole lot safer! Click on one of the ‘Highlighted’ educators, or search for specific educators by filtering your results by subject, country, language etc. http://edtechreview.in/trends-insights/insights/698-guide-for-teachers-on-skype-usage-in-education - A teacher's guide to using Skype in education. http://elearningindustry.com/5-creative-ways-use-skype-in-the-classroom - 5 creative ways to use Skype in the classroom.